Lynn Youngbarr, interim executive director of the Columbia Slough Watershed Council, prodded us to take a “closer look” by going for a paddle on this unique inland waterway. For decades, the Columbia Slough was the repository of raw sewage, rainwater runoff, and liquid industrial waste. 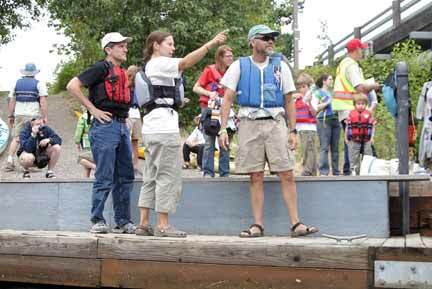 Thus, in years past, we’d covered the “Columbia Slough Regatta” from a distance‚Ä¶on land. This year was different. 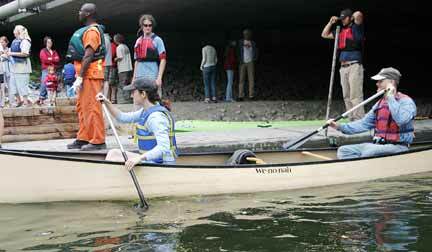 At the July 30 event, interim executive director of the Columbia Slough Watershed Council (CSWC) Lynn Youngbarr suggests we take a paddle to get “closer” to the story. These are a few of the 500 adults and kids getting ready to paddle the Slough in nearly 250 non-motorized watercraft during the Regatta. Some of the Columbia Slough is naturally-occurring. Louis and Clark reported camping along the slough. But, they couldn’t stay more than a night before moving inland. They reported that the din of the birds and animals kept them awake! 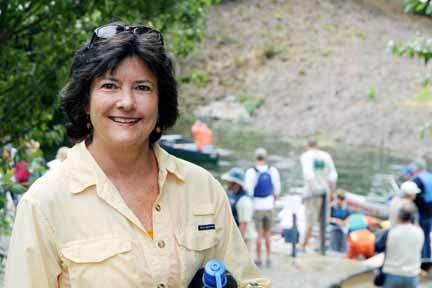 Long-time nature advocate, and Wilkes Community Group resident, Alice Blatt shows paddlers where to go. If you’ve ever seen “Alice Springs” on the map ‚Äì yup, it’s named after her! We edge closer to the dock, located in the “Big Four Corners” site, said to be the fourth largest natural area in Portland. Individuals in kayaks, and families in canoes, look like they’re having fun. At the dock, we’re introduced to Ry Thompson, Portland Bureau of Environmental Services, Slough Group. He’s offered to be our guide. Ry Thompson, was our intrepid guide as we paddled through channels making up the northern part of the Slough. We climb into a canoe and push off from the dock. Within moments, we feel safe and confident, even with our camera. Our guide was doing the paddling, and we were snapping photos. Even though there were dozens of craft on the Slough, it didn’t seem crowded as we explored this inland waterway. Feeling more confident, we pick up the second paddle and start rowing. Guide Thompson doesn’t mind we’re helping out. As our strokes synchronize, we pick up speed. “At this rate, we’ll be able to see quite a bit,” he says. 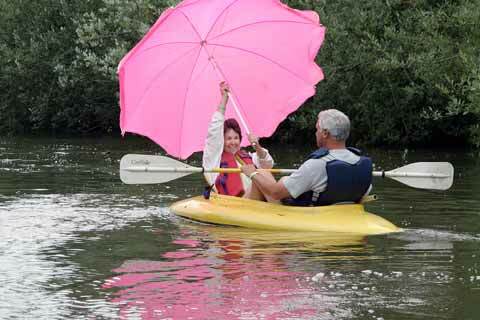 Using a parasol as a sail, Cherry Ann and Wayne Low use wind power for part of their journey on the Columbia Slough. We had expected to have our olfactory senses assaulted with nasty odors. However, there is no bad smell, even though we are cruising inches above the water. 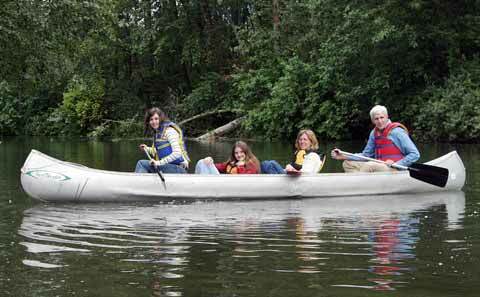 The family Hume–Rebecca, Sarah, Linda and Richmond–explore a side channel of the Columbia Slough during the Regatta. Our guide continues, “We’ve planted over a million trees and shrubs to keep the water cool. And, as we continue to reduce pollutants that come into the Slough, the water quality gets better and better.” However, he advises against swimming in the water just yet. After what seems like only a few moments, we realized we’ve been out nearly a half-hour. “Time to turn back,” Thompson advises. “But we have time to take a look at this side channel.” We both paddle, and slip swiftly along the waterway. Rob Dolphin was first introduced to the Slough as part of his job. Now, he says he’s “fallen in love with it” as he paddles by us. One of the many people we meet along the way is Rob Dolphin, an employee of the Owens Illinois Glass Company located on the Slough at Johnson Lake. 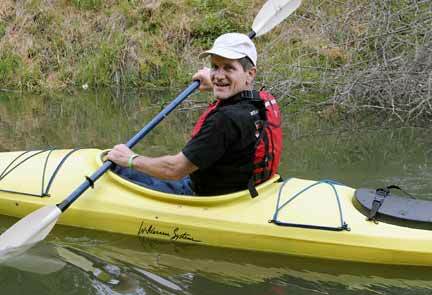 CSWC board chair Chuck Harrison glides up, and talks with us about the Slough. Soon, we’re able to hold another on-the-water interview. This time, it’s with Chuck Harrison, the chair of CSWC. Too soon, it was time to return to the dock, as this couple was doing, so others could enjoy their own canoe ride in the Columbia Slough. Looking at the time, we notice we are a little overdue getting the canoe back to the dock, so others can enjoy the Regatta. As we both paddle, our craft slips swiftly through the water; we soon glide up to the dock. 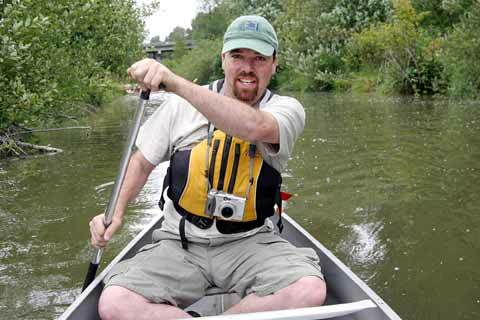 Want to explore the eastern of the Columbia Slough for yourself? The canoe launch we used is located at 16550 NE Airport Way, but there are others available. For more information, go online to www.portlandonline.com/bes/index.cfm?c=dccac. And, to learn more about the CSWC, see www.columbiaslough.org. Here’s a secret: If you don’t own a canoe, you can borrow one from the Council! 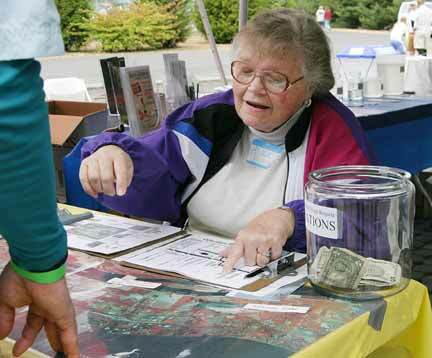 It’s another good reason to check out the CSWC, and check into your Columbia Slough.